Kim Ki Nam (Kim Ki-nam) is a former Workers’ Party of Korea Vice Chairman and the immediate past WPK Propaganda and Agitation Department [PAD] Director. Until his retirement he was the DPRK’s leading official who manages the country’s media, press and culture. A former diplomatic official and academic, Kim was a close social cohort of Kim Jong Il’s. He led propaganda efforts in support of KJI’s succession to his father, Kim Il Sung, and has led similar efforts to support KJI’s successor and youngest son, Kim Jong Un. Kim Ki Nam was born in 1929 in Kangwo’n, Wo’nsan Province, the son of an iron worker. He attended Sungsil School in Pyongyang where he joined a student group opposed to the Japanese occupation. He eventually became a communist student activist. After 1945 he attended Kim Il Sung University and was sent for additional coursework in Russia. In 1952 Kim was appointed a diplomatic counsel at the DPRK Embassy in Beijing and was later appointed ambassador. Kim returned to Pyongyang in 1956 and was appointed section chief in the Korean Workers’ Party’s International Department and joined the faculty of Kim Il Sung University. Around 1961 he returned to Russia where he studied at the Soviet Union’s Higher Party School. He returned to the DPRK where he was appointed a dean at KISU and became an editorial writing at the KWP daily newspaper, Rodong Sinmun. In 1966 he was appointed deputy director of the KWP Propaganda and Agitation Department where he worked closely with Kim Jong Il who became PAD director in 1967. He 1972 he was appointed associate editor of the party’s theoretical magazine, Kulloja, and was promoted to editor in 1974. In his positions at PAD and Kulloja Kim produced essays and participated in projects that formed the basis of the religious cult around the Kim Family. In 1976 he was appointed editor-in-chief of Rodong Sinmun and Chairman of the Korean Journalists’ Union. As editor of the party daily Kim ceased publishing news accounts or photographs of the activities of Kim Jong Il’s step-mother and reputed political rival Kim Song Ae. During the late 1970s Kim Ki Nam traveled with or led delegations of the KJU or Rodong on visits to China, Japan, Tanzania and Spain. He was the primary author of the reports (including one presented by Kim Il Sung) given at the 6th Party Conference in October 1980. 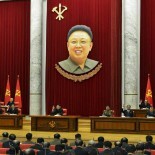 During the party congress Kim was elected a member of the Party Central Committee. In 1981 Kim Ki Nam was elected Vice-chairman of the International Reporters’ Union. During the 1980s he led a number of publicity initiatives both to support Kim Jong Il’s succession and establish Kim Il Sung’s role in history. 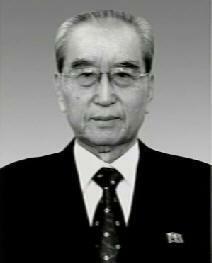 Kim had a significant role in the authorship of essays and speeches attributed to Kim Jong Il. He also managed the establishment, reported by DPRK media as “discoveries,” of slogan-bearing trees. From April 1989 to the present, Kim has been director of PAD. In 1992 he was elected a KWP Secretary, enhancing his status. With over four decades of service in the central party, Kim Ki Nam exerts tremendous policy and personnel influence over the country’s press, media, fine arts and publishing. He has also served as the party’s key author of political slogans. He has had a leading role in the approval or authorship of essays, slogans and other media in support of the hereditary succession. In May 2009 he was photographed with Kim Jong Un, as well as siblings Kim Jong Chol and Kim Yo Jong, during a visit to Wo’nsan University of Agriculture which was a signature event in the Jong Un succession drive. If reports of Kim Jong Chol’s activity in PAD are accurate, it is likely he is working under Kim Ki Nam’s tutelage. Kim Ki Nam has also been responsible for much of the staging and choreography of the various national events after Kim Jong Il’s December 2011 death, including the funeral services and events and KJI’s birthday celebrations in February 2012. 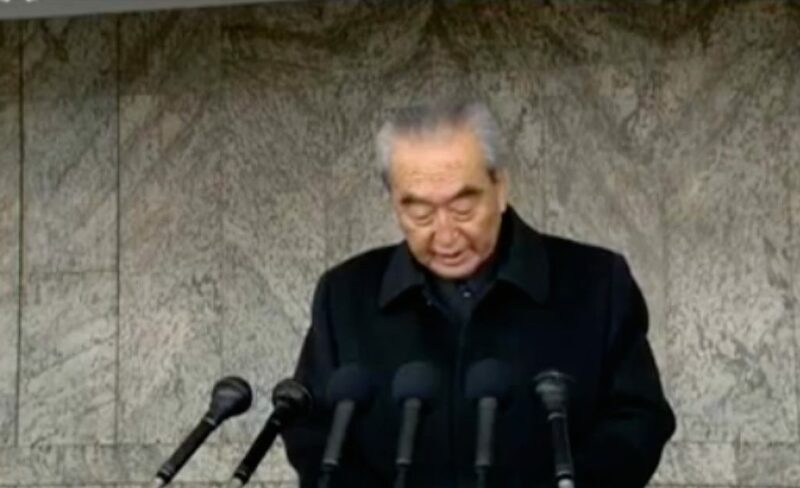 WPK Secretary Kim Ki Nam gives a congratulatory speech at a mass rally celebrating the KMS-4 launch in central Pyongyang on February 8, 2016 (Photo: KCTV screengrab). In October 2017, during the second plenary meeting of the 7th WPK Central Committee, Kim Ki Nam retired from office. Since his retirement, he makes some appearances at public events indicating he is still on good terms with the regime. Kim Ki Nam had a close relationship with Kim Jong Il with several sources explicitly stating he “was KJI’s drinking buddy.” He attended numerous “close aide” and Kim family parties and other social events. Kim also had close ties to Kim Kyong Hui, as well as links to the Ministry of State Security and its former chief functionary, Gen. U Tong Chuk (with whom Kim was regularly seen conversing when KJI was alive. ).